Prisms have long been an important tool used to study light, perhaps most notably used by Isaac Newton in 1665. Isaac Newton was the first to discover that white light is made up of a variety of colors of light, and that these different parts can be manipulated. Newton proved these ideas using prisms, which can still be used to demonstrate different principals of the color spectrum. One science experiment that involves prisms is largely based on the experiments performed by Isaac Newton. In a darkened room, set a glass prism in front of a wall or other surface, then shine a flashlight so the light passes through the prism and onto the surface. Rotate the prism slowly, until the angle is right and the light refracts into a rainbow. The prism is bending the light and separating it into the seven colors of the visible light spectrum. There is another experiment that also draws from Isaac Newton’s experiments, further proving that white light is made up of different colored light. Set up the above experiment about 2 feet from the back surface. Insert a second glass prism into the beam of light, between the first prism and the wall. Slowly rotate this second prism until the rainbow becomes a beam of white light once more. Effectively, these two prisms take light apart, then put it back together. Water droplets can sometimes behave like prisms when interacting with white light. To demonstrate this, partially cover the end of a hose with your thumb to spray a thin mist of water. When done in direct sunlight, thousands of water droplets work together to refract the light, exactly like a prism. This can be used to demonstrate how rainbows are formed. 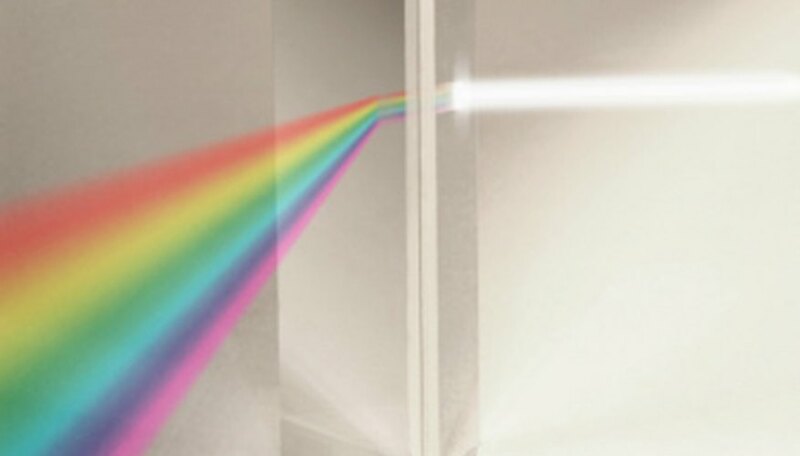 Science experiments involving prisms work to demonstrate the spectrum of visible light because each color of light travels using a different wavelength. Combined, these wavelengths are undetectable, but when shone through a prism, each wave length hits the glass surface differently. This results in the light waves bending at different rates, spreading the colors of the spectrum apart. Prince, Alicia. "Science Experiments With Prisms." Sciencing, https://sciencing.com/science-experiments-prisms-8593818.html. 24 April 2017.